Haji, B., Haji, A. (2012). A Queueing-Inventory System with Repair Center for Defective Items and One-for-One Ordering Policy. Journal of Industrial and Systems Engineering, 5(4), 230-239. Babak Haji; Alireza Haji. "A Queueing-Inventory System with Repair Center for Defective Items and One-for-One Ordering Policy". 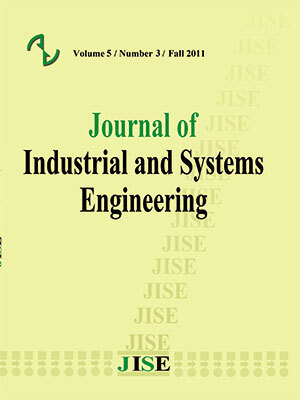 Journal of Industrial and Systems Engineering, 5, 4, 2012, 230-239. Haji, B., Haji, A. (2012). 'A Queueing-Inventory System with Repair Center for Defective Items and One-for-One Ordering Policy', Journal of Industrial and Systems Engineering, 5(4), pp. 230-239. Haji, B., Haji, A. A Queueing-Inventory System with Repair Center for Defective Items and One-for-One Ordering Policy. Journal of Industrial and Systems Engineering, 2012; 5(4): 230-239. In this paper we consider a system consisting of a supplier with a single processing unit, a repair center, and a retailer with Poisson demand. We assume that the retailer applies one-for-one ordering policy with backorders for his inventory control. The retailer’s orders form a queue in the supplier processing unit. We also assume that a certain fraction of the products produced by the supplier are defective and they must be repaired in the repair center before going to the retailer. Further, we assume that the processing time of each unit at the supplier and the service time of each defective item in the repair center are exponentially distributed random variables with known means. The purpose of this paper is to obtain the optimal value of the inventory position of the retailer which minimizes the total cost of the system. To achieve this purpose we consider two cases, Case (1) the ratio of the arrival rate to service rate, at the supplier and at the repair center are not equal and Case (2) these ratios are equal. For both cases, we first derive the long run probability distribution of the number of outstanding orders of the retailer. Then we obtain the average on hand inventory and backorders of the retailer, and derive the long run unit total cost of the system. We also investigate the convexity of this total system cost function and obtain the optimal value of the inventory position of the retailer and present a numerical example. Mathematics Methods of Operations Research. 53; 371–390. Hadley G., Whitin T.M. (1963), Analysis of Inventory Systems; Prentice Hall Inc.
One Ordering Policy; Journal of Industrial and System Engineering, 5 (1); 52-62.
order inventory-production system; European Journal of Operational Research 141; 113-132. Management Science 50 (3); 365-380. Ross S. M. (2010), Introduction to Probability Modes; Academic Press 10th Edition. and with backordering; Mathematical Methods of Operations Research 64; 383–414. Wang Y., Cohen M.A., Zheng Y.S. (2000), A two echelon repairable inventory system with stockingcenter-dependent depot replenishment lead times; Management Science 46 (11); 1441-1453. Journal of Production Economics 129; 225–231.